Forrest Worthington used his final year degree project to work on an adaption for Optimist dinghies for children with lower-limb disabilities.
" The success of the design was largely due to the amount of individual time I got from all my different lecturers every week of my final year, and the confidence they instilled in me for getting all the knowledge I needed to develop a detailed working product. " What was your main reason for choosing to study your course at Plymouth? 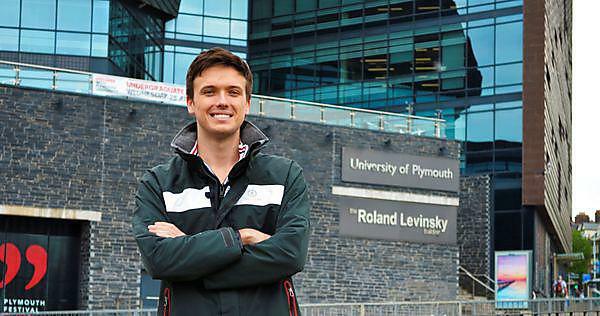 The BSc program felt like a natural progression in my life’s path and studies to date, with the added bonus one of the most renowned courses at Plymouth University. I grew-up with a strong nautical influence – in fact one of my ancestors from five generations back (great, great, great-grandfather Samuel Wilton) gained his Captain’s qualification at the Plymouth School of Navigation, in 1868. My schooling was mostly in South America, though I lived for a short while in Abu Dhabi, with easy access to sailing and diving, and living near to ports and marinas. All this sparked my interest in marine engineering, yacht and boat design, and led me to start the BSc (Hons) Marine and Composites Technology straight after finishing school. As my final year project I worked on designing structural add-ons and adaptations for an Optimist sailing dinghy, to make it sailable for children with paraplegia, with limited lower-limb manoeuvrability. The project was motivated from my own experience in sailing competitively (in dinghies and racing yachts, and as national Snipe champion in Colombia); and from working as an instructor with Optimists in South America, seeing the wide availability of these dinghies, and knowing the absolute joy that sailing can give to persons with mental and physical disabilities. The project itself, ‘Enabling Sailing: Design & feasibility research to adapt Optimist dinghies’, has sparked a global interest with the support of World Sailing and the RYA, UK’s national governing association for sailing. The success of the design was largely due to the amount of individual time I got from all my different lecturers every week of my final year, and the confidence they instilled in me for getting all the knowledge I needed to develop a detailed working product. One of the companies, WINNER Optimist (one of the largest and highest quality Optimist manufacturers in the world), had collaborated on the project and have now invited me to Denmark over the summer to work on developing four adapted Optimists. This was a very sudden but fantastic opportunity that could possibly lead to a career path in marine design for disabilities. Plus, having finished my adapted Optimist project the University media team helped me getting the project out to the public. From this outreach through social media, dinghy designers from around the world contacted me to push forward this low-cost solution for disabled youth sailing. The University is located right in the heart of the city meaning that the night life, the student housing, the faculty buildings and even the sea are all very close together - factors that have led to many exciting events and memories. On a more academic note, many of the projects done at the University were fun, interactive and pushed students to be both team workers and competitive, such as working in groups to design a hull that would be the fastest in a timed race. Having finished my adapted Optimist project, the University has prepared me with legal advice on how to navigate working with big companies while ensuring the adequate development of a produce that aims to bring a low-cost global solution for disabled sailing. I would strongly recommend this course to anyone interested in naval/maritime design and engineering. All the facilities are available to develop great innovative projects – from a composite building manufacturing facility, where students have been developing high performance carbon fibre hydrofoils for dinghies, to the marine building wave and towing tanks that allow for empirically testing hull shapes in sea-like conditions. After working in the summer with WINNER to build a few of the adapted Optimists, I will be moving to London to start a Masters in Naval Architecture at University College of London (UCL). I was able get a place at UCL thanks to the solid foundation in ship dynamics, structure and hydrodynamics taught at Plymouth University. I carried out a one-year placement in Colombia, working with ships at a container port on the Caribbean coast. The experience gave me a wide range of experience, in an often challenging work environment. Forrest Worthington with his project - Enabling Sailing: Design & feasibility research to adapt Optimist dinghies. For more information about our range of courses within the School of Engineering please visit the school page.